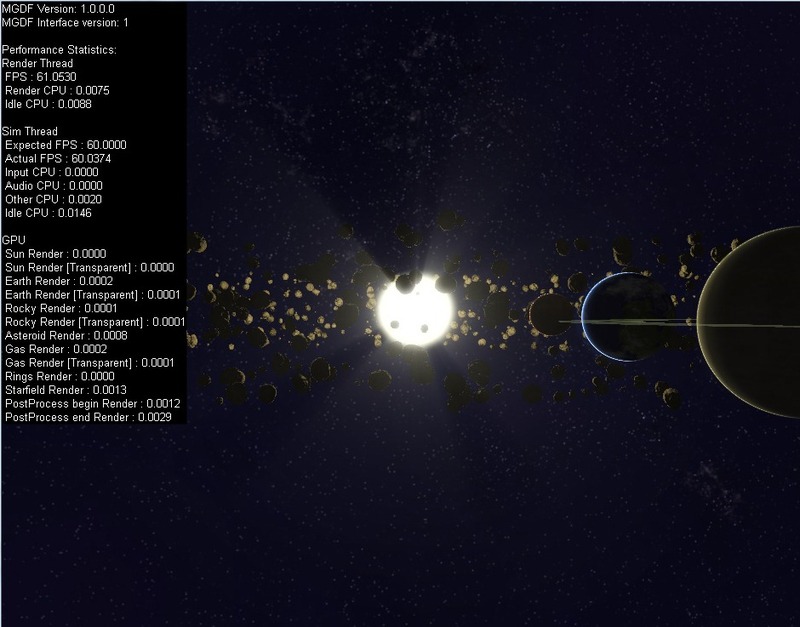 Creating a procedurally generated universe, one algorithm at a time. 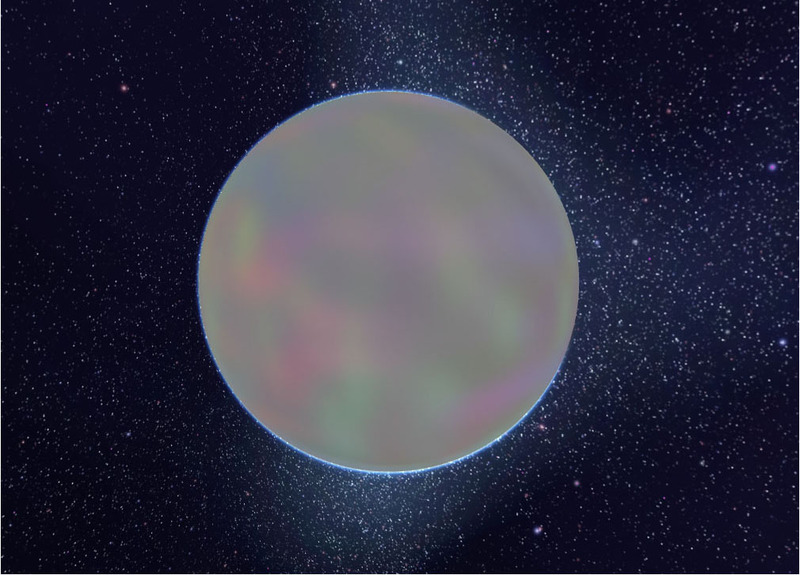 One of the main areas where I was never satisfied with Junkships procedural planetary generation was the generation of convincing looking gas giants and cloud systems on earthlike planets. I got some initially passable results by tweaking simplex noise, and adding some approximations of vortices as described here, but it never looked that great due to the fact that cloud formation is a highly physical process involving wind, temperature, pressure, and a bunch of other phenomena rooted in pysical simulation. It was always my plan to revisit this part of the system and to add some amount of fluid simulation when generating cloud layers. With that said, my goal was not to accurately model the actual physics, but to build a lightweight simulation that would give a good final result, and run fast. After reading up on the current state of the art I came across a great article here which proposed a really simple method that looked like it should tick all the boxes I was looking for. While this proved to be broadly true, there were however a number of isssues I had to overcome in order to get a satisfactory solution. The TL;DR of the technique is that you generate a heightmap using a noise function (in my case simplex noise), calculate a vector which is the gradient of the noise field at each point, then rotate that vector 90 degrees around an axis defined by the normal. This set of rotated normals is your ‘flow map’. You then take your input texture and your flow map and move every texel in the input by the vector in the matching texel of the flow map - if you do this repeatedly the input texture looks as if it is a fluid flowing according to the hills and valleys in the original height map. There is at least one other implementation of this technique out there (Heres some good slides by the developer of Space Nerds In Space) but I haven’t seen any that use the GPU to do the work. The advantage of using the GPU is that computing the flow calculations for a texture can be done dozens of times per second as opposed to minutes per texture iteration with CPU based implementations. This means that its possible on a mid range PC to generate gas giants or cloud layers within a second or two which is in keeping with my goal of having all asset generation occur near instantaneously at runtime. This generates a flowmap with a smooth contour of vectors that can be stored in the rgb components of a texture as shown below. The second problem with the technique is that it is effectively like putting the input texture into a blender, if you run enough iterations, all the original input colors will become evenly distributed and blended together. Because of this, its important to ensure that there is a limited number of flow iterations in order to allow for some mixing - but not too much. The problem with this is that the animation of the flow process looks really cool and it would be a pity to have to use a static version of a texture which is supposed to be showing cloud systems which should change appearance over time. My solution to this was to split things into 2 stages - the first is the iterative blending process where each output texture is then recombined with the flow map. Once a number of iterations have been run. Once this has been done we have an input texture that can be used as the input to the second stage. The second stage still involves the use of the flow map to warp the input texture, but importantly the output is not used as the input to the next frame (to prevent excessive mixing over time). Instead, the same input texture is used on each frame, and the flow map is rotated by a fixed amount. This gives the appearance of some dynamic fluidity when rendering, but ensures that the appearance of the texture remains consistent over long periods of time. As you can see the new technique gives vastly superior results to what I was doing before, ands its also proven to be much easier to tweak the generation parameters to provide a more predictable range of good outputs. It has been a long time since I last worked on generating procedural star fields, but I was never particularly happy with the result that I came up with in my first attempt so when some time presented itself I decided to revisit the problem to see if I could come up with a better solution. It turns out I could, below is an example of what I came up with. 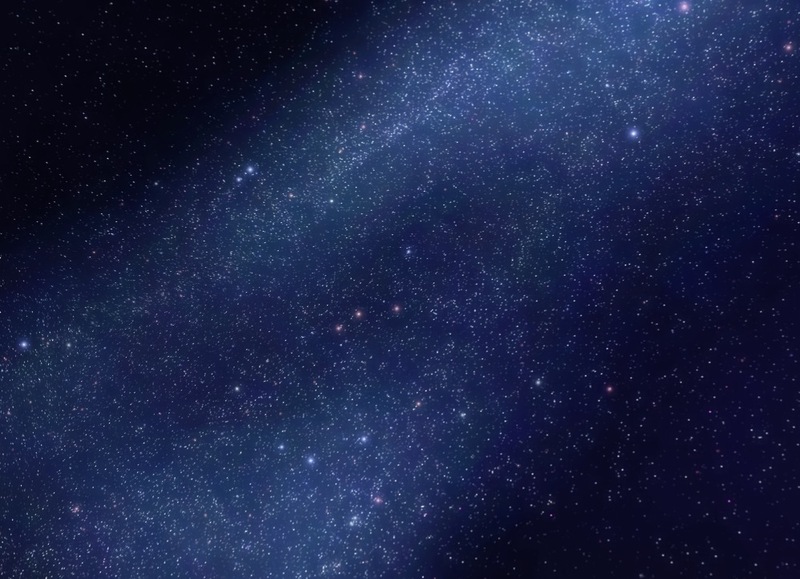 My original method (shown below) was largely based on combining successive layers of Perlin noise, and while this worked ok for the actual stars themselves it usually looked pretty terrible when it came to rendering nebulas and the gas and dust surrounding dense clusters of stars. The reason for this is that star and galaxy formation is an inherently physical process, shaped by the gravitational interactions of billions of stars and giant clouds of gas and dust. The Perlin noise approach failed to take any of these physical factors into account and as a result it was extremely difficult to tweak it to get the relationship between star and gas density correct, and to get the overall shape and structure of nebulas looking convincing. Because of this it seemed obvious that in order to get this right I was going to have to implement some sort of physics based particle system to at least approximate the physics involved. With this in mind I realized that given the number of particles that would have to be simulated (probably millions) that this was going to be impractical to do on the CPU and was going to be a job for the GPU if I wanted to keep the generation time to a minimum. I ended up writing a Compute shader in which a large number of particles are simultaneously attracted to a handful of attractor particles which move randomly about 3d space. These attractor points are repositioned each frame on the CPU (as there’s only 2 – 3 of them ) and fed into the shader as a buffer. The shader then calculates the acceleration acceleration caused by each particle due the force of each attractor ( proportional to the square of its distance between the attractor and particle ) and updates the particles position. 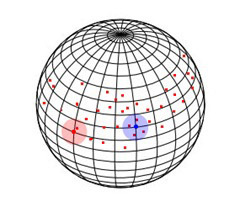 The effect of this is a very loose approximation to the force of gravity, but where all the particles can move independently of each other, making it extremely parallelizable. Having multiple attractors is essential in such a simple simulation as having a single attractor results in all particles converging toward a single point, whereas having particles being under the influences of multiple concurrent forces creates interesting and unpredictable patterns. 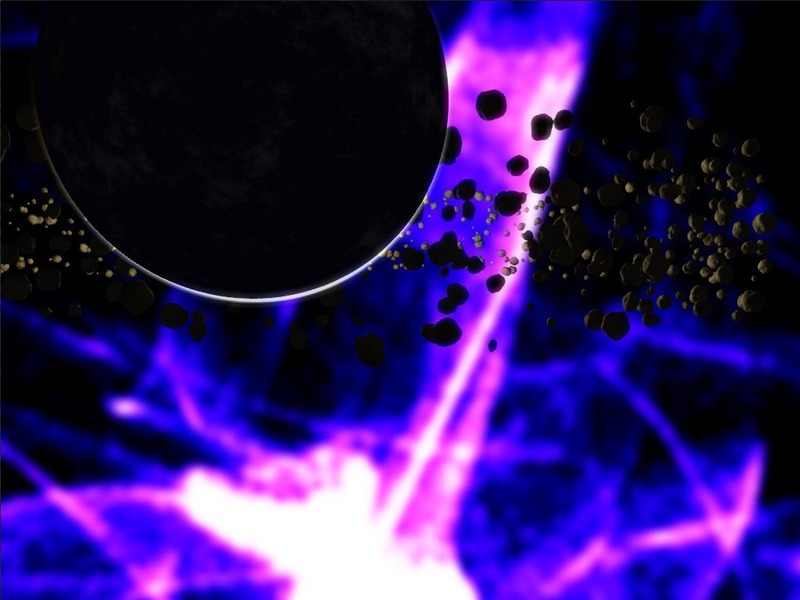 Below is an early rendering showing around 1 million particles being simulated and rendered as point sprites. //Every thread renders a particle. //If there are more threads than particles then stop here. It took me quite a while to figure out a solution for how to smooth out the particle field and I eventually figured it out after remembering an article I read about the rendering technique used to draw the skyboxes in Homeworld 2 (http://simonschreibt.de/gat/homeworld-2-backgrounds/). In that game the backgrounds were all vertex shaded using actual geometry which gave the backgrounds a very smooth almost painted look. This got me thinking, could I use vertex shading to try and smooth out the rendered cloud? I started by normalizing all the particle positions so they sat somewhere on a bounding sphere with a radius of 1 unit. Then for each vertex on that sphere I summed up the number of particles within a certain distance and recorded that as the particle density at that vertex. Turns out it worked exactly as I had hoped! the rendered clouds were now perfectly smooth provided that the sphere used to render the skybox had a sufficient polygon count. It also had the ancillary benefit of requiring far less particles for an equivalently detailed cloud which helped reduce the simulation time. 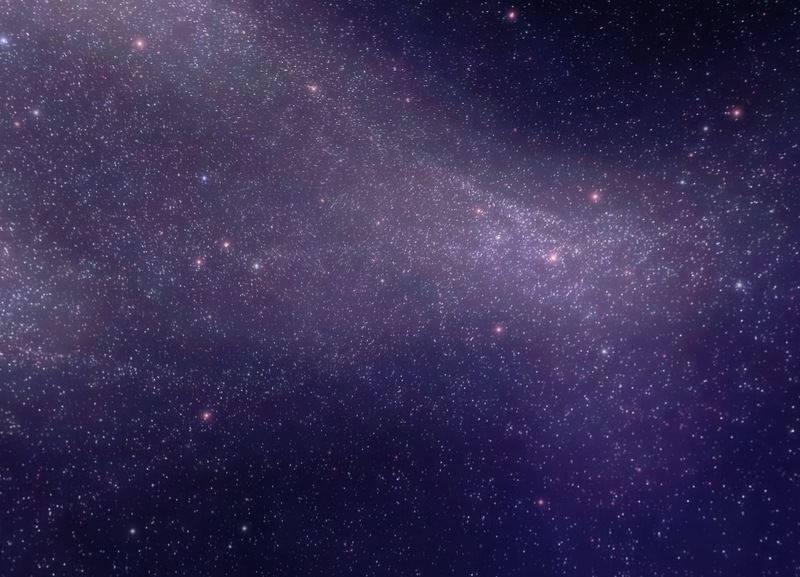 Below are a couple of different procedural star field renderings, each field is rendered after around 60 physics iterations and contains around 2 million particles for the point sprite stars, and around fifty thousand particles for the nebula clouds. 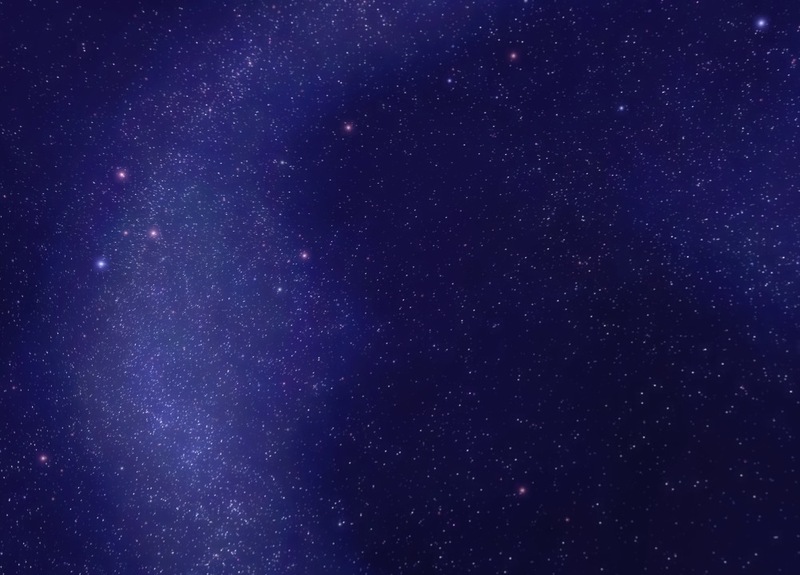 A full skybox is rendered in 300 layers with one layer per frame ( so as to not adversely affect the frame rate of other rendering ) which ends up taking around 5 seconds. I see threads all the time where people complain about game installers that have DirectX install wizards that pop up mid install, or about the size of the end user redistributable bloating their game installer. I understand why this is a problem, there’s lots of advice and documentation telling you what NOT to do when distributing DirectX (Don’t just include the dlls in your install folder! ), but not much in the way of what you SHOULD do. So after seeing another iteration of this discussion on this recent Reddit thread, I decided I’d write this post so that those who are unsure of how to redistribute DirectX in their own games installer will be able to get it right (BTW - the installer in the linked thread is doing it wrong despite the thread title). Most Windows installs already have DirectX installed by default, Windows XP SP2+ includes DirectX 9.0c, Windows Vista includes DirectX 9&10 (and SP2 includes DirectX 11), and Windows 7 includes 9,10&11 right out of the box. So really all you have to do to ensure that all prerequisites are installed correctly is to ensure that any dll’s you use that are part of the DirectX SDK and NOT part of the core DirectX install are installed. Now you need to find what D3D libraries your solution is actually using. If you’re not sure (and your using c++) In Visual Studio, go to project properties and you probably have these listed under the ‘Additional Dependencies’ field in the Linker->Input window. Take note of any .lib files starting with d or x (e.g. xinput.lib or d3dx9.lib). Now go back to the DirectX SDK Redist folder and for each lib you identified, grab the most recent copy of the corresponding .cab file. 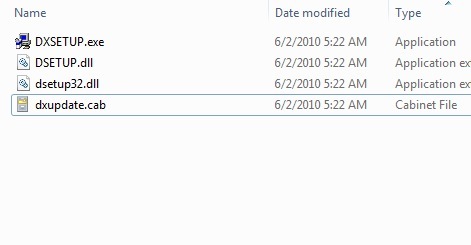 For example, if you are using d3dx9.lib, then (assuming you are using the June 2010 SDK) you would grab Jun2010_d3dx9_43_x86.cab (also assuming your game is compiled as a 32 bit application – if not, go with the x64 versions of the same .cab). Similarly if you were using xinput.lib, you would grab APR2007_xinput_x86.cab. Copy all the selected .cab files across to your install package folder we created in the previous step. It is critical that you use the /silent argument as this prevents the DirectX installer UI popping up during your own install. Don’t worry if the user already has the prerequisites, the dxsetup program is smart enough to not install anything that is already installed. Section "Install Directx 11 June 2010 update"
Well its finally done. Junkship and the MGDF framework has been fully ported from DirectX 9 to DirectX 11, and while it wasn’t something that I can say I particularly enjoyed at times – I can see in hindsight that the pain endured was worthwhile. Along the way I learnt a whole lot and recorded a number of the issues I encountered, which I will outline here for the benefit of any other wary travellers who are considering going down the same path. First things first, DirectX 11 is VERY different to DirectX 9. I skipped the whole DirectX 10 thing, so I can’t say for certain but it looks that for the most part, porting from DX10 to DX11 is relatively trivial as most of the API’s are the same (just with all the 10’s changed to 11’s). Unfortunately this is not the case with DX9 to DX11 (and so too with DX9 to DX10) – Almost every API is different, and there isn’t always a clear upgrade path for certain DX9 features. In addition, DX11 is almost universally more verbose than DX9, but in exchange you get much more flexibility. DX9 is very restrictive in certain areas, mostly due to its support for the old fixed function pipeline, and in DX11 these restrictions are gone in favor of having to write more boilerplate. In DX11 you no longer have to worry about the device getting lost. This means that you no longer have to regenerate resources from the D3DPOOL_DEFAULT (In fact the notion of putting resources in a DEFAULT or MANAGED pool no longer exists) every time the window is resized, or the user presses alt-tab. This is particularly important for Junkship as I generate large amounts of textures procedurally on the GPU, so in DX9 these resources had to be D3DPOOL_DEFAULT which meant that to prevent having to regenerate the resources every time the device became lost I had to copy each generated resource into a D3DPOOL_MANAGED resource. The problem is is that copying back to the managed pool in DX9 is very slow at the best of times, and ridiculously slow at the worst as GPU’s usually batch instructions and run independently of whatever the CPU is up to, so trying to copy a resource from the GPU before it has finished generating causes a pipeline stall which kills performance. The tricky thing is that you can’t be sure on the CPU side when the GPU has finished, so you have to make a best guess and wait and hope that you don’t stall the pipeline when you try to copy. Not having to do this pointless copying DOUBLED the speed of Junkship’s procedural texture generation. DX9 by default isn’t thread safe, and enabling multithreading support wasn’t recommended as the performance suffered considerably, luckily DX11 is considerably more multithreading friendly. Instead of executing instructions using the d3d device like in DX9, in DX11 you can construct any number of device contexts which can batch up commands on different threads and submit them to the GPU separately (the commands are still serialized on the GPU side, but this is largely transparent to the API user). Another nice feature is that you can run D3D on a thread other than the main window thread (nice if you want to have a separate render thread from the input poll loop or simulation thread) which wasn’t possible in DX9. In DX9, there’s a switch in the DirectX control panel to enable D3D debug mode, which unfortunately applies to every D3D application on your system. Unfortunately I would regularly forget to switch it back to retail mode and would wonder why games I was playing would perform poorly or have strange graphical issues. In fact during one period in which I was addicted to Galactic civilizations 2 the in game minimap started appearing blank. Amazingly I put up with this for months until one day I noticed that D3D was running in debug mode. Returning it to retail mode fixed the issue </facepalm>. DX11 has a much more sane approach of letting you define whether debug mode is enabled for specific applications. Also from my experience the debug messages in DX11 seem to be much easier to follow than their more cryptic DX9 counterparts. The venerable D3DX library has been officially deprecated in Windows 8, and so while they are still available for use with DX11, I wouldn’t recommend it. There are decent alternatives for most of the functionality provided in D3DX in the DirectXTex and DirectXTK libraries, and all the math related functionality in D3DX now exist in the built in xnamath (if you’re using the DirectX SDK) or directX math (Which is just a renamed version of xnamath if you’re using the Win8 SDK) libraries. In addition the effects framework is no longer a core part of D3DX and is instead supplied as a separate source code library, however once again I wouldn’t recommend using it. 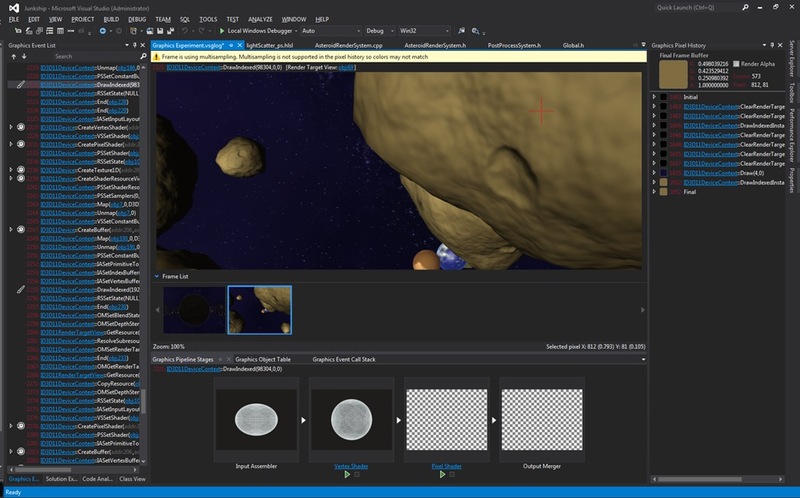 There are three main reasons, firstly is that D3DX style .fx files are now deprecated by the HLSL compiler, secondly the D3DX effects framework makes use of shader reflection and run time compilation which is verboten if you want to write a metro style game, and thirdly – its just not that good. With a little work you should be able to write an effects system that is more tailored to your games needs and is also more flexible. I wrote my own effects management system and now I get all sorts of nice benefits like altering shaders while the program is running and seeing the rendering change accordingly – I might write some more about this in future if I get time. If you weren’t already, compile your shaders offline using the FXC compiler supplied in the SDK (the flags etc. for making it work can be found here). Going forward runtime shader compilation will not be supported for Windows 8 Metro applications and should only ever be done for debug builds on your dev machine. I prefer to precompile my shaders even when developing as it lets me know instantly if my shaders are valid without having to boot up the game. To do this I wrote a small program that runs as a post build step which resolves all shader last modified times + the last modified times of any #imported shader fragments invokes FXC on them (I found this easier than configuring custom build tasks for the hlsl files in visual studio as it provides a centralized place to setup what flags etc. I want to compile with and to apply any custom processing required as a part of my effects framework). This is something that I might post up to GitHub in the future once I tidy it up. 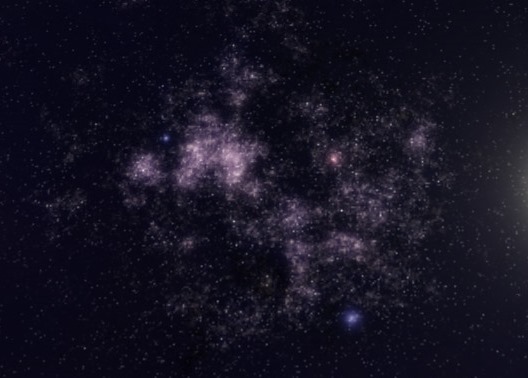 In Junkship I used the DX9 point sprites feature to render the background starfield, in DX11 the point sprites feature has been removed so to get the equivalent functionality you have two choices – Object instancing or geometry shaders. To get a point sprite effect using object instancing involves creating two vertex buffers – the first being a quad, the other being a matrix transform defining how to orient that quad for every sprite you wish to display. To render the sprites, you would then use a pixel shader which draws a texture over the quad, and using the ID3D11DeviceContext::DrawIndexedInstanced method will ensure that the sprite will be drawn for every orientation specified in the second vertex buffer. The other option (the one I chose) was to use a Geometry shader. Geometry shaders are a relatively new type of shader (introduced in DX10) which allow the GPU to generate new vertices in addition to those supplied via the usual vertex buffers. To render billboard style point sprites (sprites that always face the camera) you will need to supply all the positions of the point sprites in a vertex buffer, then in a geometry shader create 4 vertices about this position that exist on a plane that the position->camera vector is normal to (the HLSL code for this is shown below) Once this is done you should be able to use the same pixel shader as used by the instanced object technique. some reason Microsoft decided not to add support in Windows 7 for Directwrite/Direct2d access to DX11 surfaces (apparently this is remedied in Windows 8), which means that to render text one either has to rely on sprite fonts or (warning WTF approaching) create a DX10.1 device that uses DirectWrite + Direct2D to render text to a shared backbuffer with DX11. Instead of dealing with this mess I used the FW1FontWrapper library, which has met my needs thus far. Now this seems like sage wisdom, and its wisdom I agree with, however in practice I’ve found that if you begin a project without thinking at all about the performance considerations of your design decisions, you’ll come to regret it later. After you get annoyed at how slow things are, you’ll decide to do some optimizin’ and you get a couple of low hanging fruit out of the way but then quickly find that there are no more hot-spots left, but the program still performs horribly because of numerous small architectural problems. So how does one reconcile getting the important things done and not getting bogged down by excessive optimization, but also ensure that your program isn’t carrying the weight of accumulated poor decisions? Now I’m not going to claim any silver bullets here – but for me the key is to build in good instrumentation and profiling information early on, so that the performance impact of each new feature is immediately apparent. This ensures that you can control bloat as it appears, but also means that you can plow on ahead with new features if the profiling shows no performance red flags. Now profiling CPU time is a relatively trivial thing, you can use the QueryPerformanceFrequency (warning this blog post is going to be windows and DirectX centric) function to get the frequency of the high resolution timer, then take timing samples using QueryPerformanceCounter, and finally divide the sample differences by the frequency and voila! accurate profiling information! Unfortunately though in this day and age, most games are GPU - rather than CPU - bound and the previous timing method will not give you any useful information as to what’s eating your GPU’s cycles. The reason for this is that the GPU runs in parallel to the CPU, (usually a frame or two behind the CPU) so most DirectX API calls are largely non-blocking on the CPU side of things; they just queue up commands which the GPU will execute later. This means that if you sample the CPU time before and after Direct3D API calls, all you are measuring is the direct CPU cost of the call, not the time that the GPU will use executing those commands at some point in the future. //oh no, the timing queries we wan't aren't supported BAIL OUT! //this to convert our timing samples into seconds. //The final timing value in seconds. Another important point to note is that these query objects MUST be released whenever the D3D device is lost/reset. I haven’t included code for doing this or ensuring that the commands are buffered correctly, however if you want a complete working example check out the Timer class in the MGDF framework that powers junkship. Junkship.net © 2016 Glenn Conner, Luke Smith, and other contributors.